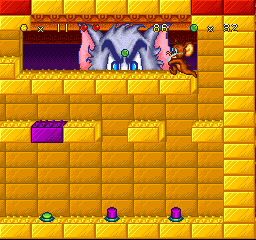 SNES Tom & Jerry (USA) in 11:32.16 by Le Hulk. In this game based on MGM's world-famous cartoon, the player controls Jerry the Mouse as he explores four different worlds: the movie theater, the junkyard, a toy-based stage and the house where most of the episodes take place. Game controls are simple: the B Button makes Jerry jump and Super Jump, and the A/Y/X Buttons will make him throw marbles straight ahead (A Button), upward (Y Button) and downward (X/Y Buttons) at the enemies. The game also features an alternating 2-Player Mode where P2 controls Jerry's nephew, Tuffy (formerly known as Nibbles). Le Hulk improves the previous publication by 45.72 seconds with better optimization.